Welcome. Breathe. This is it. Life. No dress rehearsals. You’ve got one shot so make it count. Wake up. Do what makes your heart bust wide open. Do it again. And again. Be kind. Be realistic. Be brave. Ride your bike. Ride it more. Take care of this body; don’t build a shrine to it. Meditate. That might mean ride your bike. Be generous. Be bold. Dance. Sing. Make music. 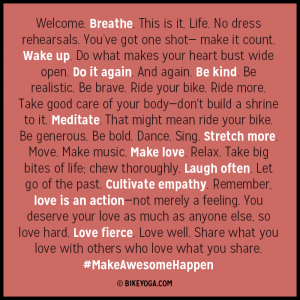 Make love. Relax. Take big bites of life but chew thoroughly. Let go of the past. Forgive. Empathize. Remember love is an action, a mindset, a choice—not just a feeling. You deserve your love as much as anyone else, so love hard. Love fierce. Love well. Laugh often. Share what you love with others who love what you share. 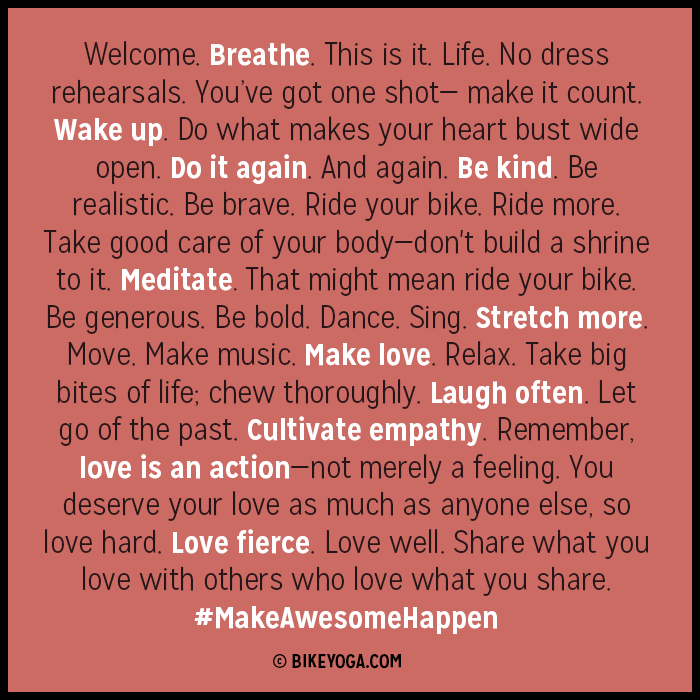 Make awesome happen.